When you’re serious about creating music, you need studio monitors that will speak nothing but the truth. Every Eris-series studio monitor utilizes a custom-woven Kevlar® low-frequency driver. The weave and nature of the Eris E4.5’s 4.5-inch Kevlar woofer result in a more constant dispersion pattern throughout the frequency range, resulting in less time-smeared audio and cleaner overall sound. Today’s music producers deal with a wide variety of musical genres and often work in challenging mixing environments. That’s why Eris-series studio monitors offer extensive acoustic tuning controls. The three-position Acoustic Space switch helps to compensate for the boundary bass boost that can occur when a monitor is placed in a corner or near a wall. High and Mid controls help to further mitigate room anomalies. A Low Cutoff filter makes it easy to integrate a Temblor® T8 subwoofer into your monitor setup, allowing you to adjust the upper end of the Temblor’s range to match the lower end of your full-range speakers. With three different types of audio inputs, it’s easy to feed audio to your Eris monitors from a mixer, an interface, a media player, or almost any other line-level source. The Eris E4.5 is equipped with stereo ¼”, 1/8”, and RCA inputs. With this selection, you’ll have no problem hooking your Eris speakers up with virtually any line-level source, including your smartphone. The Eris E4.5s are also equipped with a headphone amplifier so you can check your mix on your favorite headphones or quickly cut an overdub without repatching cables. 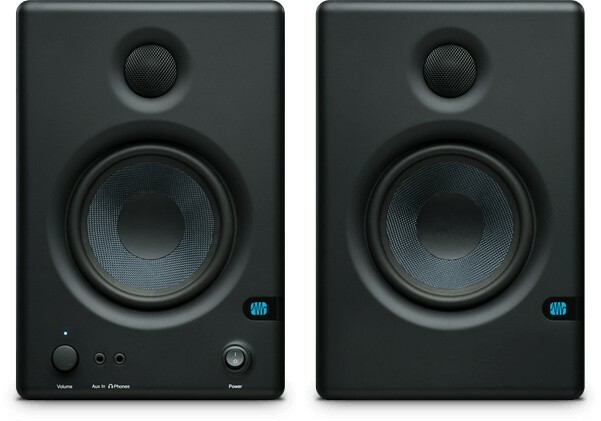 Like all PreSonus® studio monitors, the Eris E4.5 offers consistent, accurate listening. Their compact and powerful design makes them an ideal solution for home and professional studios alike. Their smooth and even frequency response have made Eris monitors one of the fastest growing studio monitor lines in the world. Hear them at your favorite PreSonus dealer.